The Holy Father has appointed Fr Kenneth Michael Howell as an Auxiliary Bishop of the Archdiocese of Brisbane. The announcement was made at noon Rome time today. 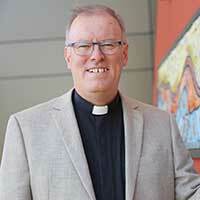 The Auxiliary Bishop-Elect will serve alongside Archbishop of Brisbane, Mark Coleridge. 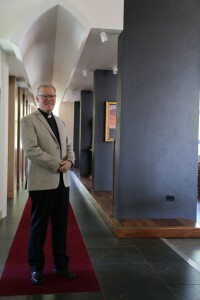 On behalf of the Australian Bishops, Archbishop Denis Hart welcomed the appointment, “Father Howell has shown gifted service as Liturgist, Cathedral Administrator and Pastor, having recently overseen the construction and completion of the new Mary, Mother of Mercy Church in the Parish of Burleigh Heads. On receiving the news, Fr Howell told the Australian Catholic Bishops Conference, “Brisbane is my home place and the Church that has nurtured my faith. It has been the great blessing of my life to serve this Church as a priest for the past 34 years. This new opportunity to serve the Brisbane church as an auxiliary bishop, I see as both a joy and an exciting challenge”. Fr Howell is looking to the future with confidence “with the gifts of the Holy Spirit and the love and prayers of the people of God who have supported my ministry”. He added, “I ask you to pray for me as I accept the invitation of our Holy Father to serve the Church as a member of the College of Bishops”. In 1977, he entered Pius XII Regional Seminary, and he was ordained a Priest on 24 June 1983. From 1983 to 1994, he worked as Assistant Priest in the Parishes of Noosa Districts, Burleigh Heads and the Cathedral, Brisbane. Between 1994 and 1997, Fr Howell completed a Licentiate in Sacred Liturgy at the Pontifical Institute Sant’Anselmo in Rome. He served as Secretary to the then Archbishop John Bathersby from 1997 to 2010. During this time, Fr Howell served at the Cathedral as Associate Pastor and Director of Worship from 1997 to 2005, Dean of the Cathedral between 2006 and 2012 and as Vice Rector of the Holy Spirit Seminary between 2002 and 2008. In 2009, he took on a concurrent appointment as Administrator of St Mary’s Parish, South Brisbane. In 2013 he became the Parish Priest at Burleigh Heads. The Bishop-Elect has been a long-standing member of the Council of Priests and Chairman from 2008 to 2013. He is also a member of the Archdiocesan Liturgical Commission, which he currently chairs. The Holy Father has also accepted the resignation of Bishop Joseph Oudeman, O.F.M. Cap as Auxiliary Bishop of Brisbane. Archbishop of Brisbane, Mark Coleridge said today, “we thank Bishop Joseph for his years of episcopal service in the Archdiocese. We pray that his years of retirement will be fruitful and peaceful. May the Lord grant him good health and the reward of a faithful servant”. The Ordination of Bishop-Elect Howell will take place on 14 June 2017 at St Stephen’s Cathedral, Brisbane. This entry was posted in Uncategorized on March 28, 2017 by ACBC Communications.